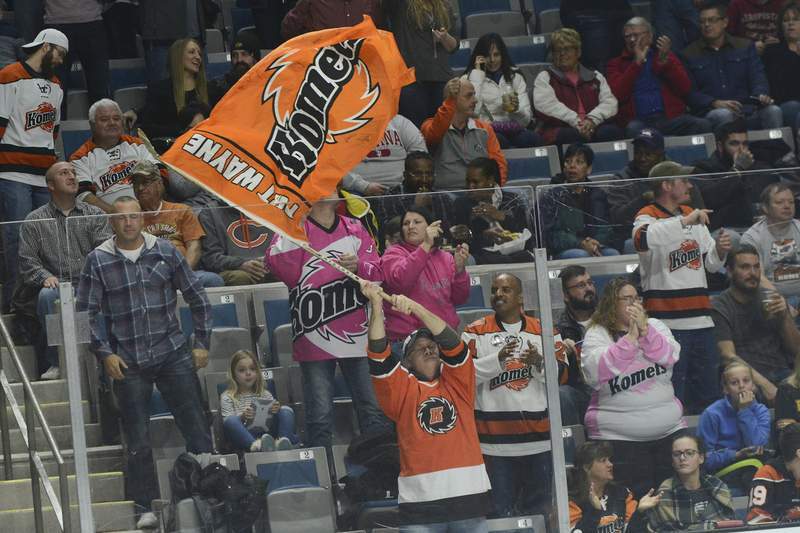 Brett Luke | The Journal Gazette Komets fans celebrate after their first goal during the first period at the Coliseum Saturday night. Brett Luke | The Journal Gazette Garrett Thompson of the Komets celebrates after his teammate scores during the first period at the Coliseum Saturday night. Brett Luke | The Journal Gazette Greg Dodds of the Swamp Rabbits misses a block on a shot made by Shawn Szydlowski of the Komets during the first period at the Coliseum Saturday night. Brett Luke | The Journal Gazette Komets trap Brenden Kotyk of the Swamp Rabbits to force a turnover during the first period at the Coliseum Saturday night. Brett Luke | The Journal Gazette Curtis Leonard of the Komets intercepts Jack Nevins of the Swamp Rabbits before he can take an open shot during the first period at the Coliseum Saturday night. Brett Luke | The Journal Gazette Marco Roy of the Komets forces a turnover against the Swamp Rabbits during the first period at the Coliseum Saturday night. Brett Luke | The Journal Gazette Michael Houser of the Komets stops the Swamp Rabbits from continually attacking the goal during the first period at the Coliseum Saturday night. 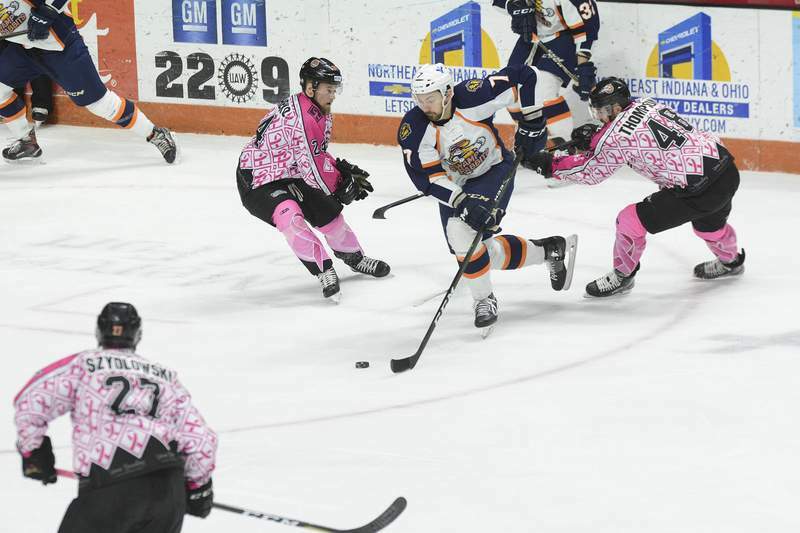 Artur Tyanulin gave all the fans some nervous moments when he took a boarding penalty in the waning minutes of the third period Saturday night in a tied game against the lowly Greenville Swamp Rabbits. 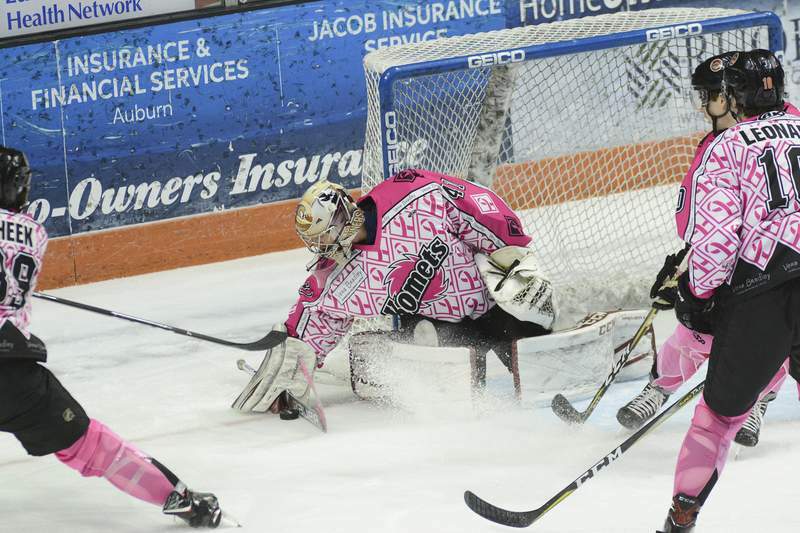 His teammates bailed him out by killing off the ensuing power play and Tyanulin returned the favor in the 4-on-4 overtime, going end to end before flicking the puck past goaltender Ty Rimmer for a 3-2 victory that kept Fort Wayne atop the Central Division. The Komets (37-13-3) have won 16 of their last 18 games. The Swamp Rabbits (20-30-5) have lost 16 of 18. Tyanulin, the rookie, who was Fort Wayne’s lone representative in the ECHL’s All-Star Game, had also tied the game at 2 in the second period. Greenville scored on 2 of 5 power plays. Fort Wayne was 1 for 3 in front of 9,081 fans at Memorial Coliseum. Fort Wayne outshot Greenville 39-24. 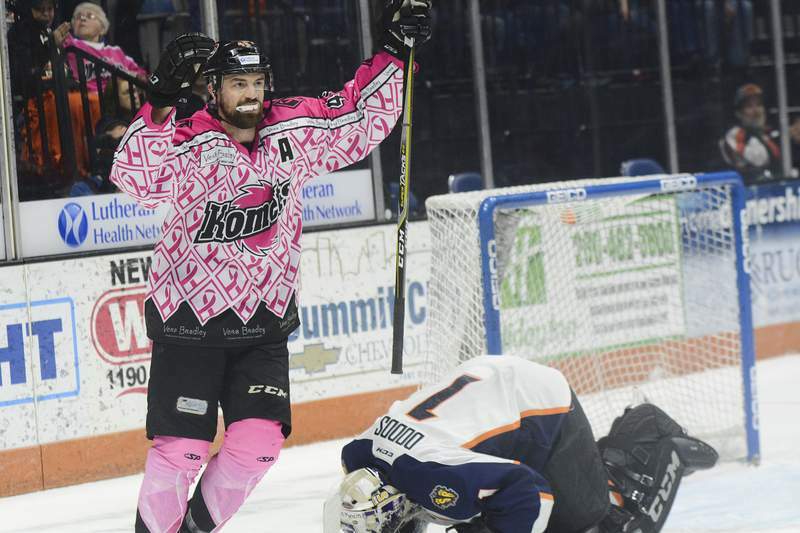 It was the second ever head-to-head meeting as head coaches by the Komets’ Gary Graham and the Swamp Rabbits’ Brian Gratz, longtime friends and natives of Fort Wayne, and the Komets donned pink jerseys that were auctioned off to benefit the Vera Bradley Foundation’s fight against breast cancer. 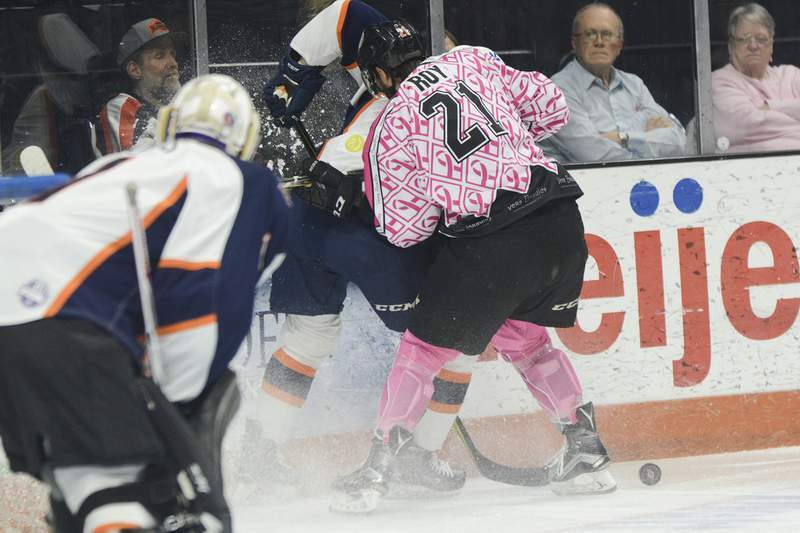 The Komets had defeated the Swamp Rabbits 4-1 on Friday at the Coliseum, where they allowed a season-low 15 shots on goal and didn’t face a shot in the second period – a feat accomplished only three times in their 66 seasons of play. 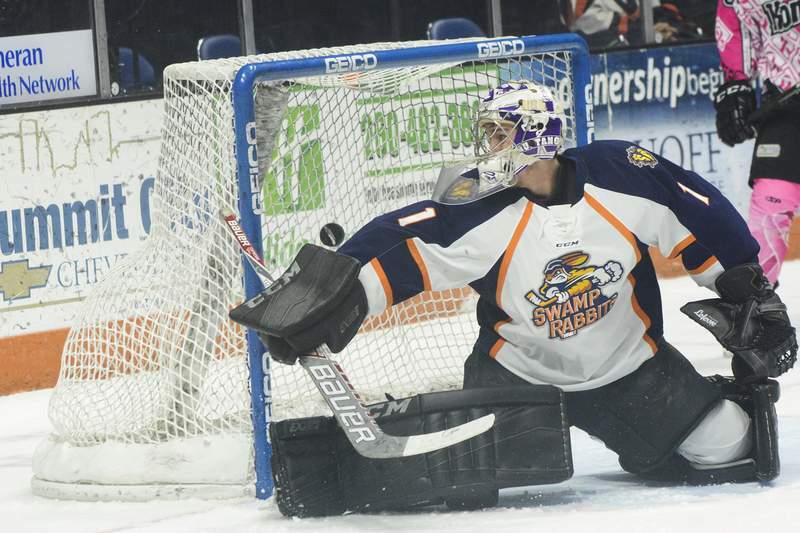 Rimmer had been in net for the Swamp Rabbits for that loss, stopping 38 of 41 shots, and was to have Saturday off before an unusual sequence led to Fort Wayne’s first goal. During a power play, Marco Roy fired a 45-foot shot that clearly injured Greenville goalie Greg Dodds, but referee Sean Fernandez allowed play to continue long enough for Roy to tip the puck to Shawn Szydlowski for a shot from the left circle and a 1-0 lead 7:04 into the first period. Dodds, who had five saves, then was replaced by Rimmer and their teammates rallied quickly for a 2-1 lead that included power-play goals from Garret Clemment and Sean Flanagan. The Komets were actually being outshot 13-12 when they tied it at 2 at 4:35 of the second period on a goal by Artur Tyanulin, who tipped the puck into an open net after Garrett Thompson had chipped it from the left circle and it bobbled past Rimmer and defenseman Vytal Cote. Fort Wayne had a plethora of offensive opportunities during the rest of the second period but couldn’t capitalize on Komets goalie Michael Houser came up with a huge save at 17:55 on Carter Sandlak at the end of a 3-on-1 rush. 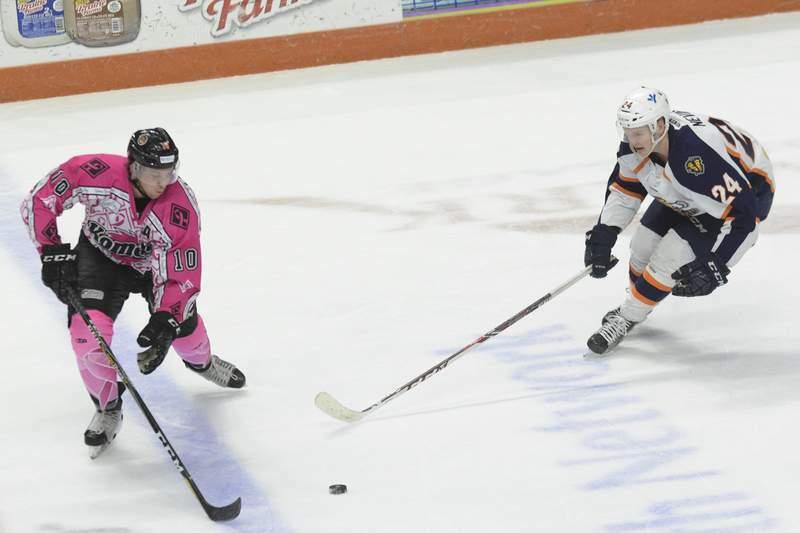 Notes: Trevor Cheek’s point-scoring streak ended at eight games for the Komets. … Among the Komets’ scratches were captain Jamie Schaafsma (lower body), Cody Sol (elbow), Justin MacDonald and Louick Marcotte.